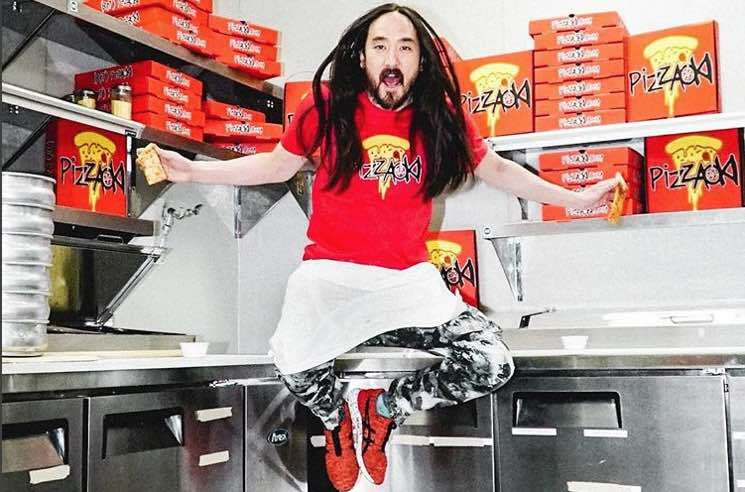 EDM star Steve Aoki may be known for butchering tracks by the likes of Soundgarden and Blink-182, but his latest business venture is a little harder to screw up and a lot more universally adored — pizza. Yes, Aoki has opened a pizza delivery joint in L.A., and it really is going by the name of Pizzaoki. The menu is equally cheesy, featuring pies inspired by his music career. The classic pepperoni pizza has been redubbed "Steveroni," and there's also a "Dim Mak" meat lovers option named after his label. There are also plenty of song-inspired menu options like "Just Hold On," "No Beef," "Mayhem," "Turbulence," "Neon Future" and "Boneless." The delivery-only service is available in the Los Angeles area via UberEats and Postmates, from 4 p.m. until 2 a.m. Sunday through Wednesday and from 4 p.m. to 4 a.m. Thursday through Saturday. See the full menu here.